What do we mean by bite-size? Bite-size is effectively ‘chunking’ relevant content into manageable nuggets of information. It is a great way to engage learners who prefer snappy, accessible and easy to remember content. Making information available in digestible portions provides students with the opportunity to work through material in stages, allowing them to focus on topics, which results in deeper, more meaningful learning. Today’s learners are flooded with a sometimes overwhelming wealth of information and have constant interaction with digital social spaces, chats and apps on their mobile devices. They are accustomed to media rich content and need the flexibility to learn on the go, as and when it suits them. Video is an increasingly popular source of content on both mobile and desktop. It tops the search results and presents itself as an enticing alternative to learners (for further information, please read our article Why Use Video in Your Learning and Teaching). Tutors can harness this technology, to creatively enhance their practice and provide short yet substantial content which is appropriate to current learning trends. Determine a learning outcome that you wish to achieve and emphasise a topic or a selection of relevant topics in a session. Use natural break points within the topics to segment the content and think about the flow and progression of content. 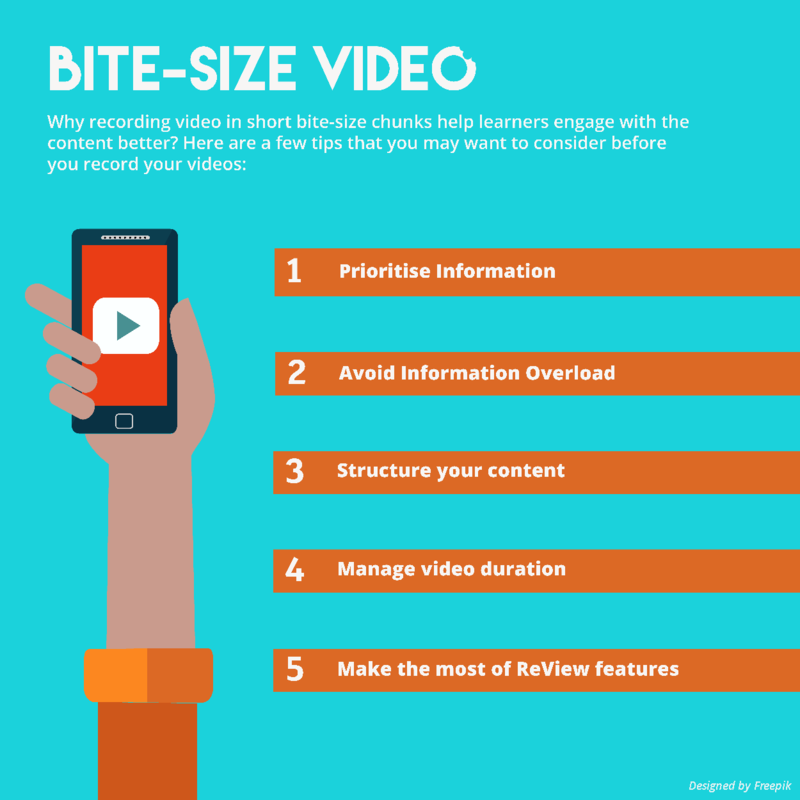 Focused, bite-sized videos are particularly useful for revision, where students can access information easily instead of skipping through a lengthy video searching for a specific topic. Research suggests that a person’s working memory has the capacity to store only a small amount of information at a given time. Grouping content into manageable segments aids learners to remember, recall and apply the knowledge more effectively in the long term. Annotations and references to diagrams/visuals are excellent memory cues in recordings, as opposed to a continuous stream of text for example. If your video features PowerPoint (or any other package) to present lecture materials, format and organise the content on the slides clearly. With the addition of voiceover, students are more likely to listen to the audio whilst they skim through the text. So, try using bullet points, numbered lists or highlight key text and subheadings to structure textual content making it easier for students to digest. This is most certainly one of the very first things students look at before they click ‘play’. Keeping the video short and concise is good for both staff and students. By recording smaller, shorter clips, you can update the content easily without spending an extensive amount of time or resources. Students on the other hand, are more likely to be attracted to a short, 10-minute video compared to lengthy lecture. The recommended duration is between 10 – 15 minutes, where students can learn on any platform, anytime – on the bus, during breaks or just before a session. ReView automatically adds an index by extracting PowerPoint slide titles into a table of content, which acts as chapter markers in the recording enabling users to skip to the relevant slide. Users can also search for key words or phrases present in the recording. Using these features students can access specific learning they desire easily and quickly. Interested in learning more about recording video, lecture capture and ReView? Click here to see upcoming ReView training events. Thank you for the comment Jo. Indeed this approach will benefit all learners and their current learning style across the board and is not exclusive to video content. As you’ve pointed out, it would be useful and interesting to research on best practices and approaches when designing more intensive modules. This is a really pertinent blog and a subject that resonates with my own experience. Bite sized learning materials are something that we seem to consider far more readily for distance learners and yet its important to remember that bite sized lectures are also appealing to many face to face learners. At the SOH&SC 2016 Winter Conference the feedback was very positive relating to its bite-sized delivery and the resulting increase of presenters we were able to include. The flip side of this is that some students will need to develop the capability to focus on longer chunks of information (a skill that many health professionals require), so we need to be mindful of this too when developing curricula.